I finished a summer card tonight and will be joining a few challenges with this one. Tilda is colored with distress inks. My patternes papers are from my boxes of scraps. Have used the wonderful doily lace ouch from Martha Stewart, flowers and mushrooms are from Papirloftet and the little green "rocks" are from imaginisce, fastened with my irock tool (getting mroe comfotable with it now). I love this creation. The colors are spectacular! Gorgeous work, I love all the pretty detail. Thanks for joining us this week at TOMIC. Tilda looks so cute and I love that summer feeling. 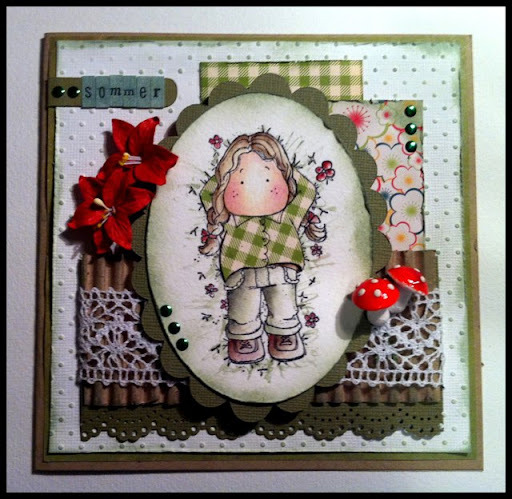 So cute, thanks for sharing your darling card! Oh my goodness! I love these colors and this Tilda! SOooooOo STUNNING!!! !